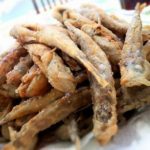 Deep fried whitebait: Whitebait are young fish and around the Mediterranean are young sardines or anchovies. 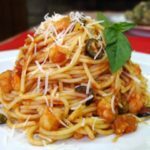 In Italy, they are known as ‘gianchetti‘ or ‘bianchetti‘ and are often prepared with a light coating of flour and deep-fried. 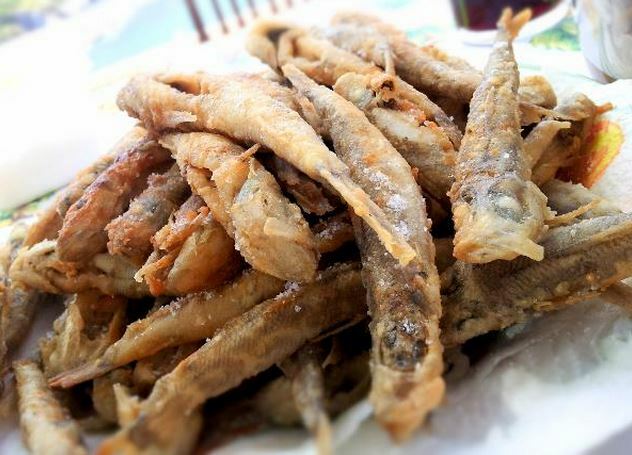 In Britian these are known as deep fried whitebait and often served with a marie rose dip and fresh wedge of lemon. In Italian this dish is called ‘Frittelle di Gianchetti‘ and along the coastlines of Italy, is considered a delicacy. Normally 125 – 200 grams (1/2 – 1/3 lb) will be enough for one person. Sort the fish and discard any that are broken. Combine the salt with the flour. Heat the oil to 175C/350 F.
Dust the fish in the seasoned flour shaking off any excess. Working in small batches to avoid the oil cooling, fry the fish for 2 – 3 minutes until they are golden brown and stir them to stop them sticking together. Drain on paper towel and keep them hot. If you are frying a lot of them, place them onto a baking sheet at the bottom of a low oven. Serve hot with your preferred dipping sauce or simply with the freshly cut lemon wedges. The man of the house made this particular dish for the family. They were finished up so quickly!